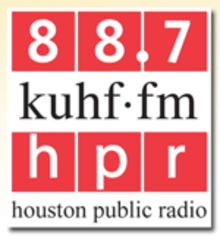 KUHF Houston Public Radio is licensed to the University of Houston, but is fully self-supported through gifts from individuals, corporations, other non-profits and foundations in the greater Houston area. It is a fully professional radio station, certified by the Corporation for Public Broadcasting, and is a member of National Public Radio (NPR), American Public Media (APM) and Public Radio International (PRI). KUHF employs 52 full-time staff in the areas of broadcast production and on-air operations; broadcast journalism and reporting; information technology and Web design; engineering; fundraising and development; marketing and business administration. Houston Public Radio exists first, to serve its listeners, in particular, and the community, in general. We care about arts, culture, information and education. We believe that Houston Public Radio is a positive, uplifting influence, both vital and necessary to our community. "Texas Originals" is a radio series profiling individuals whose life and achievements have had a profound influence upon Texas history and culture. Henry B. Gonzalez – a long-time congressman and civil rights pioneer. Walter Prescott Webb – one of the state’s most significant historians and scholars. James L. Farmer – a pioneering civil rights leader. Henry Allen Bullock devoted his life to African-American education. Americo Paredes is regarded as one of the foremost Mexican-American scholars of the 20th century. Tomas Rivera was the son of a farm laborer who became a noted author and educator dedicated to helping first generation college students. Mody Boatright was an influential folklorist and an oral history pioneer. Marion Koogler McNay created the state's first museum of modern art.